Books: Wheel of Darkness | She's Crafty! I really love these authors, and the whole concept of writing a book with a co-author. I can see how it would not be for everyone. If, as they say, all artists are a little bit crazy, then two crazy people spending a lot of time together is probably not good. But think of how useful it could be to have a partner with a fresh idea that completely counteracts your writer’s block! This is pretty much the only popular fiction I read — stuff by these guys. I would call the theme of their books, “archaeological murder mysteries.” I wanted to be an archaeologist when I was a kid. There is probably a connection there. 🙂 I spent an entire summer trying to memorize Egyptian hieroglyphics after my 4th grade class visited the mummy of Ramesses II on exhibit in Charlotte. Recently I saw a documentary about a guy who was the first to crack the Mayan language (also glyphs) when he was a student at MIT. Too bad I have such trouble finishing anything. 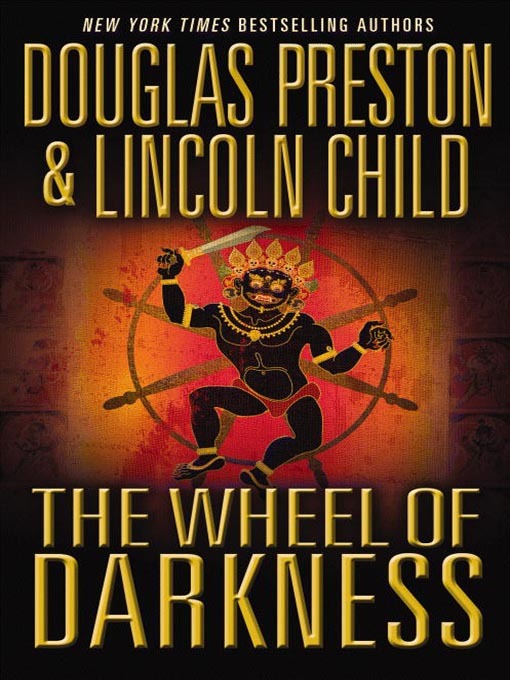 Wheel of Darkness is the third book I’ve read by these authors, and it was my least favorite so far. The whole thing takes place on a cruise ship, and the plot involving a Tibetan painting that releases evil into its viewers’ souls was a little cheesy for me. I would recommend skipping this one if you’re going to tackle their bibliography. I read and loved Book of the Dead and The Codex, and I am currently about halfway through Cabinet of Curiosities, which is great so far. My mom also read Relic and Reliquary, which she loved. Now that spring is here, I’m going to be reading alfresco quite a lot — one of my true joys in life. I have always wondered how 2 authors write a book together. I mean, people have such different tastes and it seems like it would be difficult to get a cohesive story and style in a long novel. When I read The Talisman (Stephen King and Peter Straub) I was always trying to pick out which part was written by each author, but absolutely could not discern either. Loved Relic and Reliquary. Not sure about the others. Hmmm, maybe that’s how I’m meant to write my one day novel – with help?